Mushroom is my kids' favorite dish at home. I often include this high protein tasty ingredient in our food. 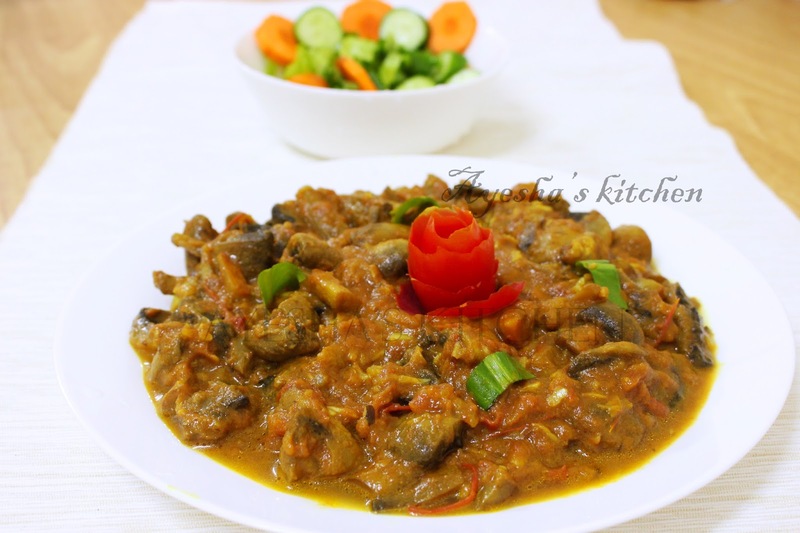 Mushrooms are versatile and therefore it can be made into a variety of dishes . Mushroom adds a very unique taste to the dish and makes it more nutritious as well as yummy. This is my simple recipe MUSHROOM ROAST which is really delicious and healthy too. Its very SIMPLE, QUICK and LESS INGREDIENT recipe. Here is the recipe showing how to make mushroom gravy / simple vegetarian side dish/veggie side dishes/mushroom recipes/lunch side dish / simple vegan side dish / vegan lunch ideas/dinner ideas. Then add green chilies, ginger and garlic paste, turmeric powder, Kashmiri chilly powder, salt and mix well. Cook till all the ingredients get mixed well. When the gravy becomes thick add the cooked mushroom. Again cook for few minutes till the mushroom get mixed well with the gravy and now add tomato sauce(optional). Finally, add curry leaves and pour 1 tbsp coconut oil on the top and now close the lid. Serve hot with Dosa, Chapathi, Batura, etc..